At the entrance to the Peljesac peninsula is a port and town Ston, which has a rich history since it was founded back in 1333rd. 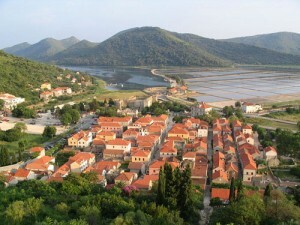 Ston, also called Ston Veli was best known for its salt pans, but today it is more popular because of its tourist attractions, for example its coast, which is great for swimming. Ston was founded by people of Dubrovnik and was, as a lot of other towns in this part of Dalmatia, for many years under the authority of the republic of Dubrovnik. At the same time, a town named Mali Ston was founded northeast of Ston. Ston was fortified with defensive wall in the form of an irregular pentagon with strong forts at the corners. The strongest of the forts, Veli Kastia, can be still seen on the southwestern part of the wall. It played a key role in the defense of the port of Ston. Northeast part of the defensive wall was continued to the village Mali Ston and thus connected the two settlements with each other. The wall, which the locals were building for almost 200 years, is several kilometers long and was used to protect the city of Dubrovnik and important Ston salt pans from the robbers and raiders from the territories that were not under the control of the Dubrovnik Republic. Ston is a great place to visit for all lovers of forts, towers and walls. But also lovers of nice clean sea will not be dissappointed, since the sea in the Bay of Prapretna near Ston is perfect for swimming, and also offers great opportunities for diving, scuba diving and exploring the underwater world. As throughout Dalmatia, Ston offers you great food, for example very tasty seafood dishes and delicious wine, which is produced by the local people.